At Torrance Oral Surgery Center we use your 3D scan to plan out your precise dental implant placement. Using your 3D scan and using a guided implant surgery kit ensures that your dental implant is placed accurately and helps us achieve the most optimal outcome for each patient. Dental implants allow for a fixed method to replace a single missing tooth or multiple missing teeth. They provide the best form of support, function and stability after natural dentition. They are also able to support dentures to prevent the need for denture adhesive. A dental implant is made of titanium, which represents the root of a tooth, making them strong, biologically compatible and will last many years. At times, additional pre-prosthetic procedures may also be required, such as ridge modification or bone and sinus augmentation. For this reason, the practice of implant dentistry requires expert treatment planning, surgery and restoration. It is a collaborative effort between the surgeon and the restorative dentist. Dr. Benjamin Yagoubian has had extensive training in oral surgery procedures and looks forward to restoring the smiles of patients with dental implants in Torrance, Carson, Palos Verdes, San Pedro, Redondo Beach and the surrounding areas. Replace missing teeth, without the need to prepare the adjacent healthy tooth. Prevent shifting of adjacent teeth and/or over-erupting of opposing teeth. Confidence in a patient’s smile. Aid in function with chewing and speech. Support of facial structures by preventing/diminishing the loss of bone. Once the jaw bone has healed after an extraction and bone graft for approximately 3-4 months, an x-ray of the area of interest is performed to evaluate the maturity of the bone. In some cases, when teeth have been missing for some time, it might be necessary to obtain a dental CT scan of the area to evaluate the height and width of the appropriate implant site. Once a patient is ready for the dental implant procedure, and after the surgery is performed, there is a waiting period for the implant to heal with the surrounding bone. 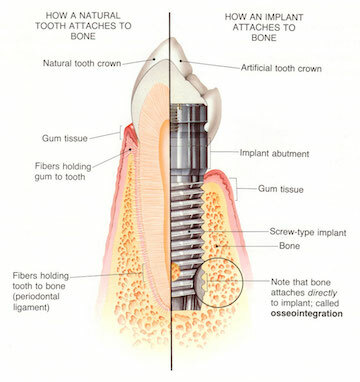 This healing period is important, as it allows for the implant and the bone to join one another (osseointegration). The waiting period around 3-4 months. After the healing period, either your oral surgeon or general dentist will begin the process of fabricating the post and eventually your crown, which will give you the function and aesthetics you deserve. Other teeth replacement options may seem less expensive at first, but many times, these procedures are being done repeatedly. It has been reported that a bridge has a lifetime duration of 10-12 years, whereas dental implants can function for over 20 years. Doing a repeat of a bridge is more costly than investing in dental implants. So yes, at first, the dental implant tooth replacement option may seem like the more expensive choice. However, it is a long-term investment that is much more predictable than other options available. At the office of Dr. Benjamin Yagoubian at Torrance Oral Surgery Center and Dental Implant Center, financing is available to make access to care easy and without delay. We perform dental implants in the Torrance, Palos Verdes, Redondo Beach and San Pedro area. Dr. Benjamin Yagoubian of the Torrance Oral Surgery Center and Dental Implant Center recommends dental implants since they restores the function and aesthetics of a natural tooth. If dental implants are not placed when a tooth is missing, the jawbone in the given area will resorb or decrease sooner and can lead to facial changes. A dental implant is a tooth replacement for a missing tooth. 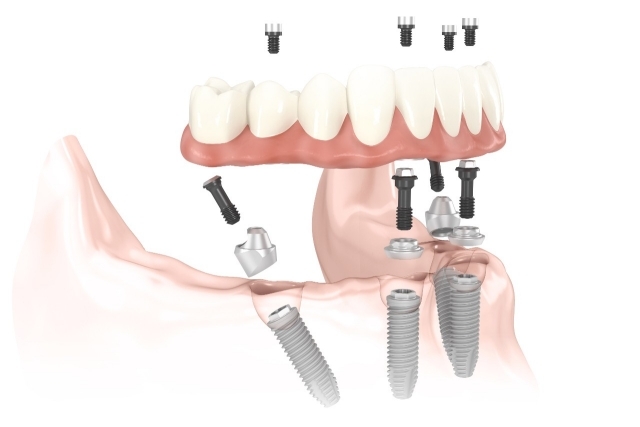 Unlike other treatments, a dental implant is a permanent solution to a missing tooth. It is the only solution that resembles a natural tooth the most. A dental implant functions and looks like the natural tooth. It does not involve grinding adjacent teeth as it would with a dental bridge and is not removable like a denture. It is a long-lasting solution when properly done by a trained oral surgeon like Dr. Benjamin Yagoubian at Torrance Oral Surgery Center and Dental Implant Center. Dental implants help impede and possibly slow down the bone resorption process. Bone resorption after a tooth extraction occurs because the body doesn’t expend energy in areas where there are missing teeth. The jawbone needs constant stimulation from a tooth or a dental implant for it to maintain the bone in an area. When a missing tooth is not replaced with a dental implant, up to 50% of bone can be lost in 12 months. It is imperative to have a dental implant placed in this time frame so more costly bone-grafting procedures are not needed. Contact Torrance Oral Surgery and Dental Implants Center today for a consultation with our oral surgeon.